A. Sisley – an artist who left behind many landscapes in the style of impressionism. He prefers to write quiet, secluded corners of the suburbs of Paris. All his landscapes are distinguished by their special lyricism, because their author is a lyricist in his heart. Often in his canvases there is a barely perceptible touch of sadness. 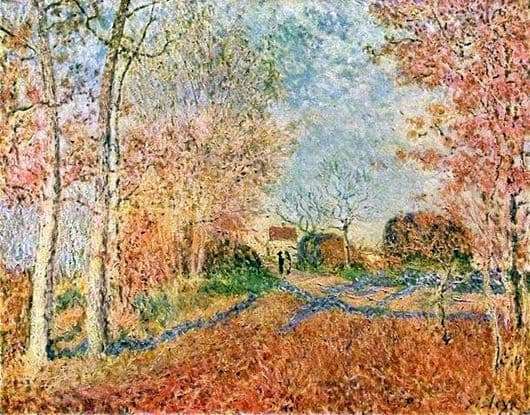 Sisley considered the transfer of color to be the most important thing in the landscape: he thought over every shade present in the work, relating it to the general sense and mood of the picture. In the painting “The Road at the Edge of the Forest”, the autumn forest in bright attire appears before the audience. Through a high yellow-red grass visible trail with several branches. Tall trees with bright yellow and red foliage frame the canvas at the edges. In the bright colors of the withering forest you can see two dark figures in the background of the picture. There is also a small light house with a red sloping roof. Almost the whole picture is the red-yellow color of autumn. Only the sky on the canvas is light blue speckled with small clouds. Small human figures emphasize the insignificance of man in comparison with nature. They do not disturb the general tranquility of the landscape. Sisley shows nature in all its beauty and power. Long tree trunks are many times the size of tiny people in the back. It is not clear who these people are. Perhaps business partners negotiating a secret deal, or perhaps a couple in love who decided to take a walk in the shade of tall trees. The artist brings a touch of sadness in his painting “The road at the edge of the forest.” Small people and huge trees are a symbol of the speed of human life. Years will pass, people coming to the edge will be different. Only the forest, covered with sunset, remains the same. The trees on the threshold of cold weather are calm, peaceful, clean and, as always, magnificent in their beauty.